If you want to check whether Christmas is just around the corner, use our days until Christmas calculator. No need to type or change anything to figure out how many days until Christmas are left since today, but you can select any other day of the year. The tool may be useful for planning the Christmas preparations - from cleaning the house to baking gingerbread cookies or making the salt dough ornaments for your unique Christmas tree. If you're curious what day Christmas is, don't wait any longer, scroll down! With our days until Christmas calculator, you can find the answer in the blink of an eye! If you leave the default value, the calculator will show you days, hours, minutes and seconds from now. However, you can pick any other day of the year, and the tool will display full days till Christmas. Isn't it awesome?! If you are curious about the time stamp between two different days - not necessarily Christmas day - check out our day counter. The Christmas Day is celebrated on December 25. In 2018 it's on Tuesday, in 2019 - on Wednesday. If you want to check next Christmas's days of the week, have a look at this day of the week calculator - with this tool, you can determine any weekday from the past or future. Do you want to check which day of the week you were born? No problem. Or you're curious what day Christmas in 2030 is? We'll help you in that task as well (it's Wednesday, by the way). white christmas calculator to see how probable is white christmas in your city! We didn't forget about you Aussies, don't feel ignored! For your Christmas time, beach price index🌴 and sunscreen calculator are a must! 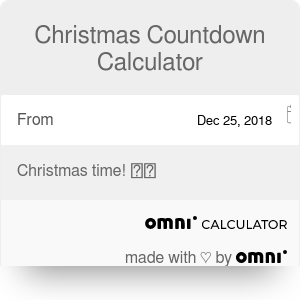 Christmas Countdown Calculator can be embedded on your website to enrich the content you wrote and make it easier for your visitors to understand your message.